You may use the Service only if you can form a binding contract with Alberta 55 plus, and only in compliance with this Agreement and all applicable local, state, national, and international laws, rules and regulations. Any use or access to the Service by anyone under 13 is strictly prohibited and in violation of this Agreement. The Service is not available to any Users previously removed from the Service by Alberta 55 plus. Subject to the terms and conditions of this Agreement, you are hereby granted a non-exclusive, limited, non-transferable, freely revocable license to use the Service for your personal, noncommercial use only (unless you are an Organization, as defined below) and as permitted by the features of the Service. Alberta 55 plus reserves all rights not expressly granted herein in the Service and the Alberta 55 plus Content (as defined below). Your Alberta 55 plus account gives you access to the services and functionality that we may establish and maintain from time to time and in our sole discretion. We may maintain different types of accounts for different types of Users, such as teams, leagues, associations, other organizations or entities and their representatives (“Organization(s)”), players, parents, or volunteers. If you open a Alberta 55 plus account on behalf of a company, Organization, or other entity, then (i) “you” includes you and that entity, and (ii) you represent and warrant that you are an authorized representative of the entity with the authority to bind the entity to this Agreement (and to any related agreements, such as order forms, which you agree to on its behalf), and that you agree to this Agreement on the entity’s behalf. By connecting to Alberta 55 plus with a third-party service, you give us permission to access and use your information from that service as permitted by that service, and to store your log-in credentials for that service. You may never use another User’s account without permission. When creating your account, you must provide accurate and complete information. You are solely responsible for the activity that occurs on your account, and you must keep your account password secure. We encourage you to use “strong” passwords (passwords that use a combination of upper and lower case letters, numbers and symbols) with your account. You must notify Alberta 55 plus immediately of any breach of security or unauthorized use of your account. You agree that Alberta 55 plus will not be liable for any losses caused by any unauthorized use of your account or of any password you create for your account. You may control your User profile and how you interact with the Service by changing the settings in your settings page. By providing Alberta 55 plus with your email address you consent to our using the email address to send you Service-related notices, including any notices required by law, in lieu of communication by postal mail. We may also use your email address to send you other messages, such as changes to features of the Service and special offers. If you do not want to receive such email messages, you may opt out or change your preferences in your settings page; provided that you may not opt-out of Service-related e-mails. Opting out may prevent you from receiving email messages regarding updates, improvements, or offers. You agree not to engage in any of the following prohibited activities: (i) copying, distributing, or disclosing any part of the Service in any medium, including without limitation by any automated or non-automated “scraping”; (ii) using any automated system, including without limitation “robots,” “spiders,” “offline readers,” etc., to access the Service in a manner that sends more request messages to the Alberta 55 plus servers than a human can reasonably produce in the same period of time by using a conventional on-line web browser (except that Alberta 55 plus grants the operators of public search engines revocable permission to use spiders to copy publicly available materials from Alberta 55 plus.com for the sole purpose of and solely to the extent necessary for creating publicly available searchable indices of the materials, but not caches or archives of such materials); (iii) transmitting spam, chain letters, or other unsolicited email; (iv) attempting to interfere with, compromise the system integrity or security or decipher any transmissions to or from the servers running the Service; (v) taking any action that imposes, or may impose at our sole discretion an unreasonable or disproportionately large load on our infrastructure; (vi) uploading invalid data, viruses, worms, or other software agents through the Service; (vii) collecting or harvesting any personally identifiable information, including account names, from the Service; (viii) using the Service for any commercial solicitation purposes; (ix) impersonating another person or otherwise misrepresenting your affiliation with a person or entity, conducting fraud, hiding or attempting to hide your identity; (x) interfering with the proper working of the Service; (xi) accessing any content on the Service through any technology or means other than those provided or authorized by the Service; or (xii) bypassing the measures we may use to prevent or restrict access to the Service, including without limitation features that prevent or restrict use or copying of any content or enforce limitations on use of the Service or the content therein. Accessing any audiovisual content that may be available on the Service for any purpose or in any manner other than Streaming (as defined below) is expressly prohibited unless explicitly permitted by the functionality of the Service. “Streaming” means a contemporaneous digital transmission of an audiovisual work via the Internet from the Alberta 55 plus Service to a User’s device in such a manner that the data is intended for real-time viewing and not intended to be copied, stored, permanently downloaded, or redistributed by the User. You are solely responsible for your interactions with other Alberta 55 plus Users. We reserve the right, but have no obligation, to monitor disputes between you and other Users. Alberta 55 plus shall have no liability for your interactions with other Users, or for any User’s action or inaction. Alberta 55 plus cares about the integrity and security of your personal information. However, we cannot guarantee that unauthorized third parties will never be able to defeat our security measures or use your personal information for improper purposes. You acknowledge that you provide your personal information at your own risk. The following applies to any Mobile Software you acquire from the iTunes Store (“iTunes-Sourced Software”): You acknowledge and agree that this Agreement is solely between you and Alberta 55 plus, not Apple, and that Apple has no responsibility for the iTunes-Sourced Software or content thereof. Your use of the iTunes-Sourced Software must comply with the App Store Terms of Service. You acknowledge that Apple has no obligation whatsoever to furnish any maintenance and support services with respect to the iTunes-Sourced Software. In the event of any failure of the iTunes-Sourced Software to conform to any applicable warranty, you may notify Apple, and Apple will refund the purchase price for the iTunes-Sourced Software to you; to the maximum extent permitted by applicable law, Apple will have no other warranty obligation whatsoever with respect to the iTunes-Sourced Software, and any other claims, losses, liabilities, damages, costs or expenses attributable to any failure to conform to any warranty will be solely governed by this Agreement and any law applicable to Alberta 55 plus as provider of the software. You acknowledge that Apple is not responsible for addressing any claims of you or any third party relating to the iTunes-Sourced Software or your possession and/or use of the iTunes-Sourced Software, including, but not limited to: (i) product liability claims; (ii) any claim that the iTunes-Sourced Software fails to conform to any applicable legal or regulatory requirement; and (iii) claims arising under consumer protection or similar legislation; and all such claims are governed solely by this Agreement and any law applicable to Alberta 55 plus as provider of the software. You acknowledge that, in the event of any third party claim that the iTunes-Sourced Software or your possession and use of that iTunes-Sourced Software infringes that third party’s intellectual property rights, Alberta 55 plus, not Apple, will be solely responsible for the investigation, defense, settlement and discharge of any such intellectual property infringement claim to the extent required by this Agreement. You and Alberta 55 plus acknowledge and agree that Apple, and Apple’s subsidiaries, are third party beneficiaries of this Agreement as relates to your license of the iTunes-Sourced Software, and that, upon your acceptance of the terms and conditions of this Agreement, Apple will have the right (and will be deemed to have accepted the right) to enforce this Agreement as relates to your license of the iTunes-Sourced Software against you as a third party beneficiary thereof. Some areas of the Service allow Users to post or submit content such as profile information, roster or biographical information, text, pictures, videos, comments, questions, and other content or information (any such materials a User submits, posts, displays, or otherwise makes available on the Service or to Alberta 55 plus is “User Content”). We claim no ownership rights over User Content created by you. The User Content you create remains yours; however, by sharing User Content through the Service, you agree to allow others to view, edit, and/or share your User Content in accordance with your settings and this Agreement. Alberta 55 plus has the right (but not the obligation) in its sole discretion to remove any User Content that is shared via the Service. You agree not to post User Content that: (i) may create a risk of harm, loss, physical or mental injury, emotional distress, death, disability, disfigurement, or physical or mental illness to you, to any other person, or to any animal; (ii) may create a risk of any other loss or damage to any person or property; (iii) seeks to harm or exploit children by exposing them to inappropriate content, asking for personally identifiable details or otherwise; (iv) may constitute or contribute to a crime or tort; (v) contains any information or content that we deem to be unlawful, harmful, abusive, racially or ethnically offensive, defamatory, infringing, invasive of personal privacy or publicity rights, harassing, humiliating to other people (publicly or otherwise), libelous, threatening, profane, or otherwise objectionable; (vi) contains any information or content that is illegal (including, without limitation, the disclosure of insider information under securities law or of another party’s trade secrets); (vii) contains any information or content that you do not have a right to make available under any law or under contractual or fiduciary relationships; or (viii) contains any information or content that you know is not correct and current or (ix) violates any team, league, or other applicable policy. You agree that, and represent and warrant that, any User Content that you post, and Alberta 55 plus’s use thereof as contemplated by this Agreement and the Service, does not and will not violate third-party rights of any kind, including without limitation any Intellectual Property Rights (as defined below) or rights of privacy. To the extent that your User Content contains music, you hereby represent that you are the owner of all the copyright rights, including without limitation the performance, mechanical, and sound recordings rights, with respect to each and every musical composition (including lyrics) and sound recording contained in such User Content and have the power to grant the license granted below. Alberta 55 plus reserves the right, but is not obligated, to reject and/or remove any User Content that Alberta 55 plus believes, in its sole discretion, violates these provisions. You understand that publishing your User Content on the Service is not a substitute for registering it with the U.S. Copyright Office, the Writer’s Guild of America, or any other rights organization. (iii) If you are an Organization that uses Alberta 55 plus to perform Services on your behalf and you collect personal information from individuals, you acknowledge and agree that you will not collect or cause to be collected and shared with Alberta 55 plus or hosted on Alberta 55 plus’s servers certain types of personal information that could trigger state breach notification laws in the event the information is accessed by an unauthorized person, including, but not limited to, Social Security Numbers, driver’s license numbers, bank account or credit card numbers, unless such information is provided to Alberta 55 plus in a system specifically designed to protect and store such information. If such information is shared with Alberta 55 plus or hosted on Alberta 55 plus’s servers in a manner that Alberta 55 plus deems to be insecure, Alberta 55 plus has the right, but not the obligation, in its sole discretion to delete and remove any personal information stored on its systems that it deems to be stored in an unsecure manner. In the event that an incident of unauthorized access or disclosure of such data triggers state breach notification laws because of your breach of this section, you agree that you will be wholly responsible for the timing, content, cost and method of any such notice and compliance with such laws. (iv) Alberta 55 plus may exercise the rights to your User Content granted under this Agreement without liability for payment of any guild fees, residuals, payments, fees, or royalties payable under any collective bargaining agreement or otherwise. Alberta 55 plus takes no responsibility and assumes no liability for any User Content that you or any other User or third party submits, posts, or sends over the Service. You shall be solely responsible for your User Content and the consequences of posting or publishing it, and you agree that we are only acting as a passive conduit for your online distribution and publication of your User Content. You understand and agree that you may be exposed to User Content that is inaccurate, objectionable, inappropriate for children, or otherwise unsuited to your purpose, and you agree that Alberta 55 plus shall not be liable for any damages you allege to incur as a result of User Content. You understand that Organizations are solely responsible for their independent data practices and their use or distribution of User Content or any other information or data obtained via the Service. By posting any User Content on the Service or otherwise submitting User Content to Alberta 55 plus, you expressly grant, and you represent and warrant that you have all rights necessary to grant, to Alberta 55 plus a royalty-free, sublicensable, transferable, perpetual, irrevocable, non-exclusive, worldwide license to use, reproduce, modify, publish, list information regarding, edit, translate, distribute, syndicate, publicly perform, publicly display, and make derivative works of all such User Content and your name, voice, and/or likeness as contained in your User Content, in accordance with your settings and this Agreement, in whole or in part, and in any form, media or technology, whether now known or hereafter developed, for use in connection with the Service and Alberta 55 plus’s (and its successors’ and affiliates’) business, including without limitation for promoting and redistributing part or all of the Service (and derivative works thereof) in any media formats and through any media channels. You also hereby grant each User of the Service a non-exclusive license to access your User Content through the Service (to the extent such User Content is made available to those Users via the features and functionality of the Service, including any applicable privacy settings), and to use, reproduce, distribute, display and perform such User Content as permitted through the functionality of the Service and under this Agreement. Since we respect artist and content owner rights, it is Alberta 55 plus’s policy to respond to alleged infringement notices that comply with the Digital Millennium Copyright Act of 1998 (“DMCA”). Please note that this procedure is exclusively for notifying Alberta 55 plus and its affiliates that your copyrighted material has been infringed. The preceding requirements are intended to comply with Alberta 55 plus’s rights and obligations under the DMCA, including 17 U.S.C. §512(c), but do not constitute legal advice. It may be advisable to contact an attorney regarding your rights and obligations under the DMCA and other applicable laws. In accordance with the DMCA and other applicable law, Alberta 55 plus has adopted a policy of terminating, in appropriate circumstances, Users who are deemed to be repeat infringers. Alberta 55 plus may also at its sole discretion limit access to the Service and/or terminate the accounts of any Users who infringe any intellectual property rights of others, whether or not there is any repeat infringement. Except for your User Content, the Service and all materials therein or transferred thereby, including, without limitation, software, images, text, graphics, illustrations, logos, patents, trademarks, service marks, copyrights, photographs, audio, videos, music, and User Content belonging to other Users (the “Alberta 55 plus Content”), and all Intellectual Property Rights related thereto, are the exclusive property of Alberta 55 plus and its licensors (including other Users who post User Content to the Service). Except as explicitly provided herein, nothing in this Agreement shall be deemed to create a license in or under any such Intellectual Property Rights, and you agree not to sell, license, rent, modify, distribute, copy, reproduce, transmit, publicly display, publicly perform, publish, adapt, edit or create derivative works from any Alberta 55 plus Content. Use of the Alberta 55 plus Content for any purpose not expressly permitted by this Agreement is strictly prohibited. You may choose to or we may invite you to submit comments or ideas about the Service, including without limitation about how to improve the Service or our products, and requests for improvements to the Service may be contained in an order form, statement of work, or otherwise (collectively, “Idea(s)”). By submitting any Idea, you agree that your disclosure is gratuitous, unsolicited and without restriction and will not place Alberta 55 plus under any fiduciary or other obligation, and that we are free to use the Idea without any additional compensation to you, and/or to disclose the Idea on a non-confidential basis or otherwise to anyone. Any improvements made to the Service as a result of any Idea will be solely owned by Alberta 55 plus. You further acknowledge that, by acceptance of your submission, Alberta 55 plus does not waive any rights to use similar or related ideas previously known to Alberta 55 plus, or developed by its employees, or obtained from sources other than you. Certain aspects of the Service may allow you to obtain, view or access certain league, game, team, or player statistics or records, fictional property representing real-world or virtual achievements, or to access other data or information which has been provided by other User(s) or developed by Alberta 55 plus (“Alberta 55 plus Data”). You understand and agree that regardless of terminology used, Alberta 55 plus Data represents a limited license right governed solely by the terms of this Agreement and available for distribution at Alberta 55 plus’s sole discretion. Alberta 55 plus Data is not redeemable for any sum of money or monetary value from Alberta 55 plus at any time. You acknowledge that you do not own the account you use to access the Service, nor do you possess any rights of access or rights to data stored by or on behalf of Alberta 55 plus on Alberta 55 plus servers, including without limitation any data representing or embodying any or all of your Alberta 55 plus Data. You agree that Alberta 55 plus has the absolute right to manage, regulate, control, modify and/or eliminate Alberta 55 plus Data as it sees fit in its sole discretion, in any general or specific case, and that Alberta 55 plus will have no liability to you based on its exercise of such right. All data on Alberta 55 plus’s servers are subject to deletion, alteration or transfer. NOTWITHSTANDING ANY VALUE ATTRIBUTED TO SUCH DATA BY YOU OR ANY THIRD PARTY, YOU UNDERSTAND AND AGREE THAT ANY DATA, ACCOUNT HISTORY AND ACCOUNT CONTENT RESIDING ON ALBERTA 55 PLUS‘S SERVERS, MAY BE DELETED, ALTERED, MOVED OR TRANSFERRED AT ANY TIME FOR ANY REASON IN ALBERTA 55 PLUS ‘S SOLE DISCRETION, INCLUDING AT THE REQUEST OF ANOTHER USER OR OTHER THIRD PARTY, WITH OR WITHOUT NOTICE AND WITH NO LIABILITY OF ANY KIND. Alberta 55 plus DOES NOT PROVIDE OR GUARANTEE, AND EXPRESSLY DISCLAIMS, ANY VALUE, CASH OR OTHERWISE, ATTRIBUTED TO ANY DATA RESIDING ON ALBERTA 55 PLUS’S SERVERS. Certain aspects of the Service may be provided for a fee or other charge. If you elect to use paid aspects of the Service, your use of such aspects of the Service shall be subject to this Agreement and the Subscriber Terms and Conditions [link]. You also agree to be bound by the specific terms included in any order form, statement of work, or the like (if applicable) to which you indicate your acceptance (for instance, by signing the form or via online click-through acceptance, or by making related payments to Alberta 55 plus). If there is any conflict between the Subscriber Terms and Conditions and this Agreement with respect to your use of the paid aspects of the Service, the Subscriber Terms and Conditions shall prevail. If you make a registration payment or other payment to an Organization via the Service, you agree that the transaction is solely between you and that Organization and any refund requests, including without limitation in the case of incorrect charges or unfulfilled orders, must be made directly to that Organization. If you are or you represent an Organization that signs up for any aspect of the Service by which Alberta 55 plus will facilitate the processing of payments Users make to such Organization by credit card, debit card, or other payment method, you acknowledge that Alberta 55 plus may contract with various third parties, such as banks and payment processors, to facilitate such payment processing. You must enter into a Sub-Merchant Agreement (the “Sub-Merchant Agreement”) with us and such third parties as we may select from time to time prior to Alberta 55 plus providing any services to facilitate the processing of payments Users make to such Organization. If you use the Service to conduct background screening of third parties, you acknowledge, certify, and/or agree that: (i) the background screening services are provided by a third party supplier under contract with Alberta 55 plus; (ii) the coverage and accuracy of criminal record research is limited by the corresponding jurisdictions, which regulate the data, and that this data may contain errors and omissions that cannot be controlled by Alberta 55 plus or its suppliers; (iii) Alberta 55 plus and its suppliers provide background checks only after (a) you have provided the applicant with a clear and conspicuous disclosure, in writing, that complies with the Fair Credit Reporting Act (“FCRA”) that a background check on the applicant may be obtained for employment purposes, and (b) you have received a signed authorization from the applicant to obtain background checks; (iv) you have provided such disclosure and obtained such authorization before submitting your request for a background check; (v) you will use the background reports solely for employment purposes as defined in the FCRA; (vi) within twenty-four (24) hours of a request by Alberta 55 plus, you will provide a hardcopy of these authorizations; and (vii) before taking any adverse action against any applicant, based in whole or in part on the background report, you will provide the applicant with a pre-adverse action notice, a copy of the background report, and “A Summary of Your Rights Under the Fair Credit Reporting Act,” issued by the Consumer Finance Protection Bureau. You may use mobile data in connection with Alberta 55 plus’s mobile software applications and/or opt-in to receive certain notifications or information via text messaging. You may incur additional charges from your wireless provider for these services. You agree that you are solely responsible for any such charges. THE SERVICE IS PROVIDED ON AN “AS IS” AND “AS AVAILABLE” BASIS. USE OF THE SERVICE IS AT YOUR OWN RISK. TO THE MAXIMUM EXTENT PERMITTED BY APPLICABLE LAW, THE SERVICE IS PROVIDED WITHOUT WARRANTIES OF ANY KIND, WHETHER EXPRESS OR IMPLIED, INCLUDING, BUT NOT LIMITED TO, IMPLIED WARRANTIES OF MERCHANTABILITY, FITNESS FOR A PARTICULAR PURPOSE, OR NON-INFRINGEMENT. NO ADVICE OR INFORMATION, WHETHER ORAL OR WRITTEN, OBTAINED BY YOU FROM ALBERTA 55 PLUS OR THROUGH THE SERVICE WILL CREATE ANY WARRANTY NOT EXPRESSLY STATED HEREIN. WITHOUT LIMITING THE FOREGOING, ALBERTA 55 PLUS, ITS SUBSIDIARIES, ITS AFFILIATES, AND ITS LICENSORS DO NOT WARRANT THAT THE CONTENT (INCLUDING WITHOUT LIMITATION ANY INFORMATION PROVIDED IN CONNECTION WITH BACKGROUND SCREENING) IS ACCURATE, RELIABLE OR CORRECT; THAT THE SERVICE WILL MEET YOUR REQUIREMENTS; THAT THE SERVICE WILL BE AVAILABLE AT ANY PARTICULAR TIME OR LOCATION, UNINTERRUPTED OR SECURE; THAT ANY DEFECTS OR ERRORS WILL BE CORRECTED; OR THAT THE SERVICE IS FREE OF VIRUSES OR OTHER HARMFUL COMPONENTS. ANY CONTENT DOWNLOADED OR OTHERWISE OBTAINED THROUGH THE USE OF THE SERVICE IS DOWNLOADED AT YOUR OWN RISK AND YOU WILL BE SOLELY RESPONSIBLE FOR ANY DAMAGE TO YOUR COMPUTER SYSTEM OR MOBILE DEVICE OR LOSS OF DATA THAT RESULTS FROM SUCH DOWNLOAD OR YOUR USE OF THE SERVICE. ALBERTA 55 PLUS does not warrant or make any representations concerning the accuracy, likely results, or reliability of the use of the background screening materials provided to you if you choose to use the background screening tool. ALBERTA 55 PLUS DOES NOT WARRANT, ENDORSE, GUARANTEE, OR ASSUME RESPONSIBILITY FOR ANY PRODUCT OR SERVICE ADVERTISED OR OFFERED BY A THIRD PARTY THROUGH THE ALBERTA 55 PLUS SERVICE OR ANY HYPERLINKED OR EMBEDDED WEBSITE OR SERVICE (INCLUDING WITHOUT LIMITATION THOSE OFFERED BY OTHER USERS, SUCH AS ORGANIZATIONS), AND ALBERTA 55 PLUS WILL NOT BE A PARTY TO OR IN ANY WAY MONITOR ANY TRANSACTION BETWEEN YOU AND THIRD-PARTY PROVIDERS OF PRODUCTS OR SERVICES. TO THE MAXIMUM EXTENT PERMITTED BY APPLICABLE LAW, IN NO EVENT SHALL ALBERTA 55 PLUS, ITS AFFILIATES, AGENTS, DIRECTORS, EMPLOYEES, SUPPLIERS OR LICENSORS BE LIABLE FOR ANY INDIRECT, PUNITIVE, INCIDENTAL, SPECIAL, CONSEQUENTIAL OR EXEMPLARY DAMAGES, INCLUDING WITHOUT LIMITATION DAMAGES FOR LOSS OF PROFITS, GOODWILL, USE, DATA OR OTHER INTANGIBLE LOSSES, THAT RESULT FROM THE USE OF, OR INABILITY TO USE, THIS SERVICE. UNDER NO CIRCUMSTANCES WILL ALBERTA 55 PLUS BE RESPONSIBLE FOR ANY DAMAGE, LOSS OR INJURY RESULTING FROM HACKING, TAMPERING OR OTHER UNAUTHORIZED ACCESS OR USE OF THE SERVICE OR YOUR ACCOUNT OR THE INFORMATION CONTAINED THEREIN. TO THE MAXIMUM EXTENT PERMITTED BY APPLICABLE LAW, ALBERTA 55 PLUS ASSUMES NO LIABILITY OR RESPONSIBILITY FOR ANY (I) ERRORS, MISTAKES, OR INACCURACIES OF CONTENT; (II) PERSONAL INJURY OR PROPERTY DAMAGE, OF ANY NATURE WHATSOEVER, RESULTING FROM YOUR ACCESS TO OR USE OF OUR SERVICE; (III) ANY UNAUTHORIZED ACCESS TO OR USE OF OUR SECURE SERVERS AND/OR ANY AND ALL PERSONAL INFORMATION STORED THEREIN; (IV) ANY INTERRUPTION OR CESSATION OF TRANSMISSION TO OR FROM THE SERVICE; (V) ANY BUGS, VIRUSES, TROJAN HORSES, OR THE LIKE THAT MAY BE TRANSMITTED TO OR THROUGH OUR SERVICE BY ANY THIRD PARTY; (VI) ANY ERRORS OR OMISSIONS IN ANY CONTENT OR FOR ANY LOSS OR DAMAGE INCURRED AS A RESULT OF THE USE OF ANY CONTENT POSTED, EMAILED, TRANSMITTED, OR OTHERWISE MADE AVAILABLE THROUGH THE SERVICE; AND/OR (VII) USER CONTENT OR THE DEFAMATORY, OFFENSIVE, OR ILLEGAL CONDUCT OF ANY THIRD PARTY. IN NO EVENT SHALL ALBERTA 55 PLUS, ITS AFFILIATES, AGENTS, DIRECTORS, EMPLOYEES, SUPPLIERS, OR LICENSORS BE LIABLE TO YOU FOR ANY CLAIMS, PROCEEDINGS, LIABILITIES, OBLIGATIONS, DAMAGES, LOSSES OR COSTS IN AN AMOUNT EXCEEDING $25.00. THIS LIMITATION OF LIABILITY SECTION APPLIES WHETHER THE ALLEGED LIABILITY IS BASED ON CONTRACT, TORT, NEGLIGENCE, STRICT LIABILITY, OR ANY OTHER BASIS, EVEN IF ALBERTA 55 PLUS HAS BEEN ADVISED OF THE POSSIBILITY OF SUCH DAMAGE. THE FOREGOING LIMITATION OF LIABILITY SHALL APPLY TO THE FULLEST EXTENT PERMITTED BY LAW IN THE APPLICABLE JURISDICTION. The Service is controlled and operated from facilities in Canada. Alberta 55 plus makes no representations that the Service is appropriate or available for use in other locations. Those who access or use the Service from other jurisdictions do so at their own volition and are entirely responsible for compliance with all applicable Canadian Provinces and local laws and regulations, including but not limited to export and import regulations. You may not use the Service if you are a resident of a country embargoed by Canada, or are a foreign person or entity blocked or denied by the Canadian Government. Unless otherwise explicitly stated, all materials found on the Service are solely directed to individuals, companies, or other entities located in Canada. You agree that: (i) the Service shall be deemed solely based in Alberta; and (ii) the Service shall be deemed a passive one that does not give rise to personal jurisdiction over us, either specific or general, in jurisdictions other than Alberta. This Agreement shall be governed by the internal substantive laws of the Province of Alberta, without respect to its conflict of laws principles. The parties acknowledge that this Agreement evidences a transaction involving interstate commerce. Notwithstanding the preceding sentences with respect to the substantive law, any arbitration conducted pursuant to the terms of this Agreement shall be governed by the Federal Arbitration Act (9 U.S.C. §§ 1-16). The application of the United Nations Convention on Contracts for the International Sale of Goods is expressly excluded. You agree to submit to the personal jurisdiction of the federal and provincial courts located in Edmonton, Alberta for any actions for which we retain the right to seek injunctive or other equitable relief in a court of competent jurisdiction to prevent the actual or threatened infringement, misappropriation or violation of a our copyrights, trademarks, trade secrets, patents, or other intellectual property or proprietary rights, as set forth in the Arbitration provision below, including any provisional relief required to prevent irreparable harm. You agree that Edmonton, Alberta is the proper forum for any appeals of an arbitration award or for trial court proceedings in the event that the arbitration provision below is found to be unenforceable. READ THIS SECTION CAREFULLY BECAUSE IT REQUIRES THE PARTIES TO ARBITRATE THEIR DISPUTES AND LIMITS THE MANNER IN WHICH YOU CAN SEEK RELIEF FROM Alberta 55 plus. For any dispute with Alberta 55 plus, you agree to first contact us at support@alberta55plus.ca and attempt to resolve the dispute with us informally. In the unlikely event that Alberta 55 plus has not been able to resolve a dispute it has with you after sixty (60) days, we each agree to resolve any claim, dispute, or controversy (excluding any claims for injunctive or other equitable relief as provided below) arising out of or in connection with or relating to this Agreement, or the breach or alleged breach thereof (collectively, “Claims”), except as provided herein. Any judgment on the award rendered by the arbitrator may be entered in any court of competent jurisdiction. 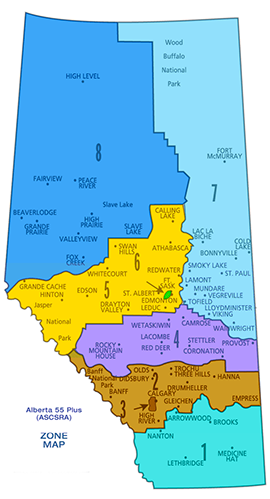 Nothing in this Section shall be deemed as preventing Alberta 55 plus from seeking injunctive or other equitable relief from the courts as necessary to prevent the actual or threatened infringement, misappropriation, or violation of our data security, Intellectual Property Rights or other proprietary rights. WITH RESPECT TO ALL PERSONS AND ENTITIES, REGARDLESS OF WHETHER THEY HAVE OBTAINED OR USED THE SERVICE FOR PERSONAL, COMMERCIAL OR OTHER PURPOSES, ALL CLAIMS MUST BE BROUGHT IN THE PARTIES’ INDIVIDUAL CAPACITY, AND NOT AS A PLAINTIFF OR CLASS MEMBER IN ANY PURPORTED CLASS ACTION, COLLECTIVE ACTION, PRIVATE ATTORNEY GENERAL ACTION OR OTHER REPRESENTATIVE PROCEEDING. THIS WAIVER APPLIES TO CLASS ARBITRATION, AND, UNLESS WE AGREE OTHERWISE, THE ARBITRATOR MAY NOT CONSOLIDATE MORE THAN ONE PERSON’S CLAIMS. YOU AGREE THAT, BY ENTERING INTO THIS AGREEMENT, YOU AND ALBERTA 55 PLUS ARE EACH WAIVING THE RIGHT TO A TRIAL BY JURY OR TO PARTICIPATE IN A CLASS ACTION, COLLECTIVE ACTION, PRIVATE ATTORNEY GENERAL ACTION, OR OTHER REPRESENTATIVE PROCEEDING OF ANY KIND. This Agreement, and any rights and licenses granted hereunder, may not be transferred or assigned by you, but may be assigned by Alberta 55 plus without restriction. Any attempted transfer or assignment in violation hereof shall be null and void. This Agreement, together with any amendments and any additional agreements you may enter into with Alberta 55 plus in connection with the Service (such as Subscriber Terms and Conditions, order forms, or statements of work), shall constitute the entire agreement between you and Alberta 55 plus concerning the Service. If any provision of this Agreement is deemed invalid by a court of competent jurisdiction, the invalidity of such provision shall not affect the validity of the remaining provisions of this Agreement, which shall remain in full force and effect, except that in the event of unenforceability of the universal Class Action/Jury Trial Waiver, the entire arbitration agreement shall be unenforceable. No waiver of any term of this Agreement shall be deemed a further or continuing waiver of such term or any other term, and Alberta 55 plus’s failure to assert any right or provision under this Agreement shall not constitute a waiver of such right or provision. Please contact us at support@alberta55plus.ca with any questions regarding this Agreement.